Early reviews have been mixed, but the handful of folks who’ve seen Valerian and the City of a Thousand Planets (which is an unwieldy mouthful of a title) concur it’s a visual spectacle. Which is mostly what I care about. 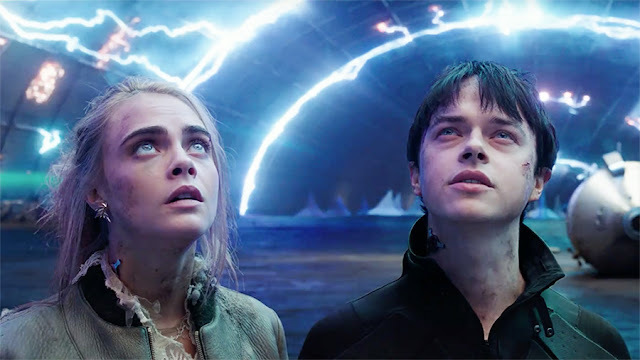 It stars to beautiful wooden children (Dane DeHaan and Cara Delevingne), but all I want is some sci-fi lunacy. And these glimpses certainly offer that and more. Easily the most plot-heavy of the clips, this shows off the bug-nuts visual style. It’s easy to see why Valerian garners so many comparisons to The Fifth Element—they bear definite visual similarities. And I am super on board with a spiritual sequel. This clip gives us a good idea of what some of the non-space action looks like. It also provides ample face time with one of the many weird-as-hell creatures we can expect to see. Again, Valerian stars two beautiful wooden children, so I don’t know how much audiences are going to get out of that, but lordy, does it look spectacular. There’s a definite Star Wars vibe going on in this clip, at least aesthetically. You may sense a theme here, but the more I watch, the less certain I am that these two leads can carry the entire film. But maybe I’m wrong, we’ll see. Thanks to scenes like this, I can’t wait to see Valerian blasted across the biggest screen I can find. Valerian also stars Clive Owen, John Goodman, Rihanna, Ethan Hawke, Rutger Hauer, and tons of unusual alien creatures. From the early reactions, Valerian and the City of a Thousand Planets is inventive and gorgeous and full of fantastic world building. Some of the story reportedly leaves much to be desired, but it’s amazing what eye-popping visual mayhem can make up for. And we’ll find out just how much it needs to make up for on July 21.